The images, gathered during a routine angiogram, are fed into a supercomputer. 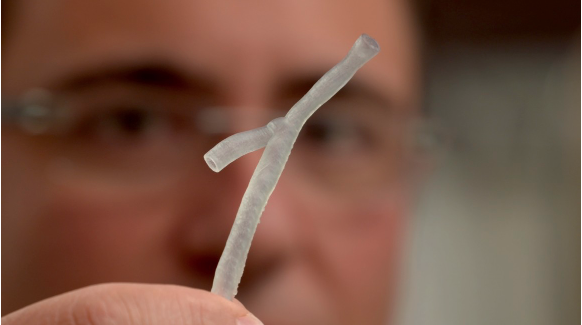 Within 24 hours, a model of a person’s artery is 3D printed. This gives cardiologists crucial information about the behaviour of blood flow and the precise structure of the artery from the inside. The technique can also detect ‘hot spots’ for plaque, the waxy substance that builds up in arteries and causes heart disease. Some of these plaques have been difficult to find using traditional techniques. Heart disease remains the number one killer in Australia, affecting one in every six adults. Every nine minutes a person suffers a heart attack. New techniques to predict plaque build up in the heart will be essential to reduce this toll. Lead author, University of Melbourne Associate Professor Peter Barlis, is an interventional cardiologist with St Vincent’s and Northern Hospitals. “Using our ultra-sensitive heart scans combined with models derived using supercomputers, we are now able to print out segments of the patient’s arteries and hope to tailor devices to fit them perfectly,” Associate Professor Barlis said. “No two arteries are shaped the same. We’re all different, with arteries that have different branches and sizes, tapering from larger to smaller. And much like debris accumulates along a riverbank, plaque can cling to certain areas of a person’s artery. So this technology really gives us a clearer picture of those areas. Identifying which plaques go on to cause a heart attack remains the ‘holy grail’ of cardiology. “Using a super-high resolution camera, known as optical coherence tomography (OCT), to scan the insides of the heart arteries has made it easier to image cholesterol plaques, but it still isn't clear which of these plaques will go on to cause heart attacks," Associate Professor Barlis said. Associate Professor Barlis introduced OCT to Australia in 2009 and has been refining the technology to benefit cardiac patients since. He said 3D modelling has very promising potential to predict where plaques could form and will ultimately help cardiologists predict heart attacks. Co-author and University of Melbourne researcher Dr Vikas Thondapu said the clues about dangerous cholesterol plaques lie in certain disturbances in blood flow patterns. “Our work involves using supercomputers to simulate blood flow in the arteries. The goal is to use blood flow patterns and disturbances to potentially predict the future development of high-risk plaques,” Dr Thondapu said. Associate Professor Barlis and his team now have two ARC grants to work with the University’s Engineering School, to find a biocompatible polymer to 3D print heart stents to precisely match a person’s physical makeup, reducing the risk of stent collapse or complications.